Edited -My services were back after 4 days! I am thankful but my question is does this take that long! Problem number 1 still not resolved! I have been a very loyal Customer of Airtel for like a decade now! I used to feel very proud of my self for using the best telecom in India. But recently your unprofessional attitude has really been a worry to me to continue my loyalty towards Airtel. I am on roaming so i shifted to a 799 my plan and all the packages i have taken are for 3G data usage. Most of my work depends on Internet and that is the case with almost every one today. Specially for me as i earn my bread through internet so i hope you guys can understand how will it be for me not to have a working internet connection. 1) On 18th December i had lodged a complaint- Issue was low 3g signals at my place and mostly 2G signals coming. It was shocking for me as i used to get full 3G speed at my home. I had lodged a complaint on 18th Dec and no call from your team/ Network Team for further inquiry. The Complaint is still open as of 22/12/14 7 PM IST . Well i guess it must be a joke for you guys not to take your job seriously but i do take my job seriously and my work has been suffering a hell lot since i work from home. 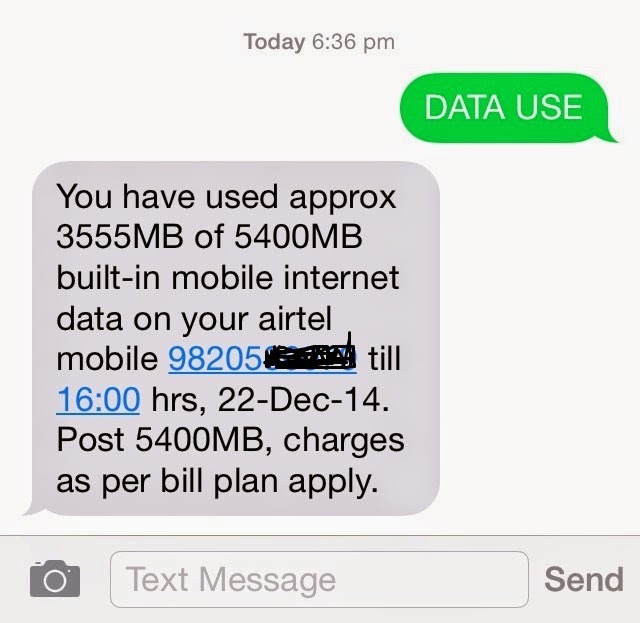 2) On 20th Dec 2014 i get a SMS from airtel saying " You have consumed 100% of the bill shield value on your airtel mobile. Speed will now be revised" I was shocked on reading this SMS as normally get alerts on using 80% of Mobile Data. On checking my airtel app i saw approximately 1.8 GB 3G data left i thought must be a technical glitch at your end. So i went online to check if my 3g was working properly but no it was not. I called up customer care and explained them the issue their response was sir yes you have 1.8 GB data left so kindly ignore the message the speed will be back to normal in sometime just remember to switch off and switch on the mobile phone. Since that day i have been calling up airtel everyday to ask why is my 3g not working and the reply i get is give us 24 hours . On 22/12/14 i called up airtel customer care and spoke to the executive around 6:30PM she told me that sir you have consumed 100% of your data as i can see on the system. I was shocked by this response so i sent a message to 121 to check my data usage and the reply was " You have used 3555 MB of 5400MB till 16:00 Hrs on 22/12/14. So on reading out the message i was told that sir the complaint on 18th Dec i still open! Hello Unprofessional set of people the complaint of 18th dec is open and i know that as it has not been resolved but what about this stupid issue of my 3G data not working at all in-spite of having roughly 1.8 GB left. Nothing has been done regarding my problem. If i have 3G data left and their is an issue with your back-end team which sent me a message that 3g data usage is 100% and speed will be revised somebody please go and tell them i have a lot of data left and kindly get my speed back to normal. AirTel wake up Remember Customer is King!